Why You Need To Do Less, Not More, If You Want To Succeed. In today’s episode, I want to dive in to why you need to do less and not more if you want to accomplish really anything and succeed in whatever it is that your business is. I want to say that as with anything and all things that I share, this is something that I myself have gone through but it is also something that I have experienced working with my clients and the people that I am blessed and honored to hold space for. Truth be told, the results or the outcomes that I see are really miraculous. I know that may sound far-out but to me a miracle is a shift in perception from fear to love. So when you shift your fear-based idea that you have to work more in order to accomplish more and succeed into the space of you actually have to do less in order to accomplish more and succeed, then you shift from fear to love and in that sense it actually totally at least to me makes sense. That being said, as always I invite you to take what serves you and leave the rest. The idea that we have to work more to me is based in a patriarchal, shadow-based, fear-based mindset. It is what is driving you into the ground because whatever it is you do, it won’t ever be enough. From a love-based perspective, you are enough whether you do anything or not. You simply are by your inheritance, your expansion of source, your being of love – you are enough, point blank. That being said, I am not saying that you – this is not a “get out of jail” card. So I’m not saying you don’t do anything. I’m not saying that you simply sit back and don’t do anything. That’s not what this about. What I am saying is that if you have a “to do” list of a million things, you probably also experience the very significant stress. You probably thoughts of “I’m not enough. I will never make it. There’s never enough time.” That is not a very nice place to be nor is it in any way, shape, or form serving you in your business. Like I said, I have experience with this not only personally but with a client as well – more than one, actually. The idea of doing less can be an idea that can be very – at first you can have a lot of resistance to it because the notion of having to do more and more and more is so heavily ingrained in you. So if you notice any resistance or pushback coming up within you as I say this and as we go through this episode, just know that that is totally fine. It’s okay but if you’re still here. If there’s something that’s still calling you, my take on that is that your soul brought you here and there is something that you need to hear. I want to tell you just a little bit about a client that I have. That is that when we first started, she had a list that exhausted me. Just as her coach, that exhausted me. She was working from morning ‘til night doing her thing. She had a business. It was running. However, there was never any free time for herself so she was getting up in the morning, getting her son ready. Then she was working. She was doing her thing. Then she came back. She fed her son and once he was in bed at night, then she would work again. This was really driving her to the ground. When I introduced the idea of, you know, “You have to do less, not more,” her expression was just one of horror and one of, “You cannot be telling me this!” She was very reluctant, very resistant, and for a long time, even though I kept planting the seed, it was not what she did. She would come into the sessions, she would agree, and then once she was out of the sessions, when we met up the next time, it was very clear that she had not really followed through on the thing that we had agreed to. We all have our own journeys and when I coach or mentor or facilitate in any way, shape, or form, while I am your guide and your coach, I am not there to push you nor force you nor coerce you because those methods to me – it’s a way of fear, it’s a way of ego, and it’s not the way that I work. I have a philosophy or background or a foundation of love with love with love. So I kept planting the seed. I kept watering the sprouts so that knowing that eventually it would get there. Because that’s what happens with all of my clients, whether it be in masterminds, in one-on-ones, or in healing work. There always comes a moment where all of a sudden, it clicks. Things shift and truth be told, every time it happens, I cry. I ball my eyes out because it is so, so beautiful. It’s not beautiful for me. It’s more the knowing what will come of this, knowing the expansion that will happen from that place. It still gives me the goosebumps and chills because it is such a beautiful moment but more so it is a beautiful moment because when you begin to expand from a space of love, it causes a ripple effect whether people know it or not. You create a ripple effect that expands out into the world and that’s why I cry whenever that happens, because it truly is such a beautiful moment. Now this client of mine – like I said, when we first starting working together, she had a “to do” list that was longer than I don’t know what. She was involved in so many projects. She was very, very connected and heavily connected to her divine feminine. She had all of these ideas that kept downloading and – but her divine masculine essence was not activated. Instead, she was pushing herself. She was forcing herself. She was abusing herself. She was trying to make things happen and had the idea that you have to keep doing, doing, doing if you want to accomplish or succeed. Over the course of, I think about a year and a half that we worked together, once that piece for her landed, that she needed not do more but do less and to focus on one thing at a time, this deep sense of calm, this deep sense of accomplishment, this deep sense of satisfaction came into her life and this is not only her. It’s in me; that was my journey as well. It is the journey for those that I hold space for. When that landed, what happened was her idea – and this is the idea of most people, maybe even yours – is that if you do less, you accomplish less. However, that’s not the truth. Once you surrender – once you surrender into focusing on just one thing at a time, finishing it, on putting it out into the world, of letting it breathe and have life before you move onto the next – that gives you like I said such a deep sense of accomplishment, of satisfaction, of nourishment that is not of this world. It also gives you a sense of success. Now I want to be careful with the word success because very often it is driven, at least in our world today – it is based in external factors. So it’s about the big car or the right purse or the right shoes or all of these external proofs that you’ve succeeded. That is not to me real success. Real success to me is serving those that I’m here to serve. It is being able to nourish myself fully and completely. It is being able to set boundaries. It is being able to accomplish what I came here to do. It is a – to me, success is of – it’s a sense of satisfaction. It is of the soul. It is not about how much money I can make. It is not about how many of a thing that I can have. It is to me being of service to those that I’m here to serve, those with whom I have made a contract eons ago to serve. That, to me, is the real success. That success to me comes through being and doing what you came here to do. So like I said in the beginning, this is not about you not doing anything but it’s about prioritizing. It’s about focusing and again doing less in order to accomplish more. That foundation is not only one that I do in my one-on-ones but it is also the foundation that’s the reason why in my mastermind that on every Monday I ask the participants to list their top three priorities. At first, there is a lot of resistance to that because “what do you mean, Mariaestela? Only three things?” Well, it’s not because I just want you to do three things. It’s because I know being the smart cookie that I am – I know you are the smart cookie. So doing three things doesn’t mean that you only have to do three things. It means that you prioritize those three things and I will say this: Prioritizing three things on your list rarely means just doing three things. Very often there is a lot entailed in that just one thing. So prioritizing three things actually may mean that you have a lot of different tasks. However, what it gives you – but when we come to the Friday – because on Friday’s we celebrate our accomplishments. On Friday, it gives you that deep sense of satisfaction knowing, “I actually accomplished this” and you can acknowledge yourself for this. Why is that important? It’s important because when we acknowledge ourselves, when we accomplish things, we come from a space of love rather than from a space of fear and that is to me the most important thing of everything that you are and everything that you do. It is that shift because it is that shift that once you have that you again, like I said in the beginning, you expand from that space and your products and your services, your blog posts, your videos, everything that you do will expand from that space. My mastermind is now open for enrollment. We start in January and you have about a month, a month and a half before the early bird offer runs out. I have created a magnificent early bird offer that expires on December 21st. 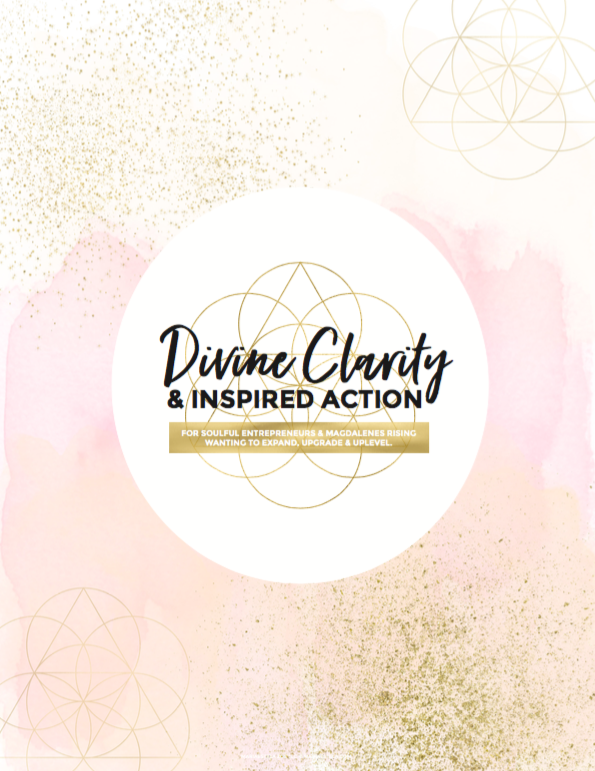 if you are a spiritual, soul-driven, heart-based entrepreneur, a Magdalene rising who would love to be part of a sacred community of up to 12 women who over the course of 10 months is going to be focusing on being and doing from a space of love, of expanding your business and your presence and your confidence and the way that you are in this world, I invite you to take a look. You can find it here: The Magdalene Rising Mastermind. Number one, I would love to hear from you if you’re someone who struggles with this. Share it with us in the comments below. Comment with how do you struggle with this and let me see how I can serve you. Number two, if you’re someone who has actually gone through this and have achieved the “out of this world” results that come with that, please do share that with us as well so that it may serve as an inspiration for everyone. That is what I have for you today. I love you. Until next time, take care..